Photoshop CS4, with its updated interface and new features designed to streamline your workflow and integrate seamlessly with other products in Creative Suite 4, is now more powerful than ever before. But, with such a rich, powerful and varied set of tools and commands, where do you begin? Facing such a steep learning curve, many users achieve only the first few levels of proficiency. 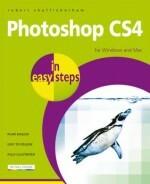 Photoshop CS4 in easy steps is designed to activate the full potential in the extensive Photoshop feature set. It achieves this by breaking down the application into a logical sequence of learning events. 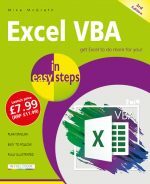 The book begins with a detailed tutorial on essential concepts and terms, introducing you to the revamped Photoshop screen environment and its vocabulary. Then with easy step-by-step instructions and fact-filled sidebars, the primer walks you through the fundamental aspects of this image-editing application. Photoshop CS4 in easy steps builds on its established reputation to guide you through the essentials of image file formats; making and refining selections; painting and editing; working with layers, paths and the pen tool, channels and masks; and color correction techniques. It doesn't stop there. As well as introducing new and enhanced features such as the powerful and accessible Adjustment Layers and Masks panels, the amazing simplicity of Context Aware Scaling, and a host of user friendly improvements to existing features, the book's final chapters cover applications in the ever-growing field of web and multimedia images. These chapters teach even relative novices the ABCs of slicing, image optimization and animations. Adobe Photoshop CS4 sets the standard for professional image-editing. Photoshop CS4 in easy steps, with its clear instructions and plentiful screenshots, brings the full potential of this exciting creative tool to your fingertips.